852086 LEGO Star Wars Magnet Set is a Star Wars set released in 2007. 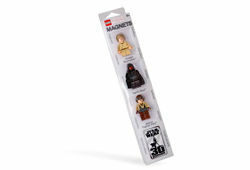 It contains magnets of Darth Maul, Anakin Skywalker (Episode I), and a Naboo Fighter Pilot. Facts about "852086 LEGO Star Wars Magnet Set"
This page was last edited on 9 February 2019, at 23:14.